The design details of the HUAWEI P8 evoke the pages, bindings and hardcovers of traditional books. The one-piece aluminum body with the diamond shape blasting craftsmanship highlights the texture of the metal. The phone comes with four elegant color options: silver, gold, black and gray. The devices come in a translucent package and the unboxing experience is like taking a book from the shelf. •The nano-injection molding process results in an industry-leading seamless tight junction connecting a 1.5 mm thin plastic bar with one of the industry’s largest screens. •The phone is 6.4 mm thin, with dual SIM cards, and works seamlessly with a 4G network (where the service is available). •The triple-layer shark-gill design enhances the reliability and robustness of the device. •Inside, the new Kirin 930 64-bit Octa-Core chipset boosts performance by approximately 20 percent compared with other phones with similar levels of battery life. •The body’s sleek back cover is constructed of steel, for reinforced structural rigidity. The HUAWEI P8 is designed to have a natural connection to human nature, providing solutions to common pain points and meeting consumers’ needs – both simple and complex. 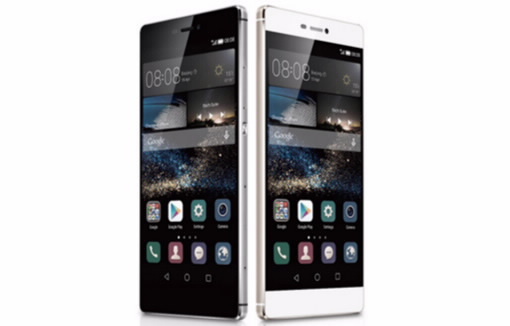 The HUAWEI P8 has a revolutionary touch screen experience that is innate to consumers. Double-tapping a knuckle captures a full-length screen shot, while drawing a circle on the screen quickly captures content. Additionally, the “search phone by voice” function allows users to call out to their misplaced smartphone, which will respond through its speaker to identify. Unique power management creates a bridge between the HUAWEI P8’s slim design, power efficiently and stunning performance. The device contains a 2,680 mAh battery and with Kirin 930 Octa-Core 64-bit chipset, delivering outstanding performance that outpaces the smartphone market by 20 percent. •For 4G SIM card users, the device features dual 4G SIM card support with two flexible card slots. •Once the HUAWEI P8 has identified and connected with a Bluetooth device such as the HUAWEI TalkBand B2, the phone can be remotely unlocked without entering a password. •With network roaming performance optimized for 4G, the HUAWEI P8 connects with network roaming services approximately three times faster than average phone models. •Additionally, with an optional E-ink screen on the back of the phone, the metal back cover can switch to an eBook in just seconds. •Industry-leading Optical Image Stabilizer technology up to 1.2°, enabling high-quality photos and videos, and managing camera shake so images are consistently sharp. •The world’s first four-color RGBW sensor enhances brightness by 32 percent in high contrast lighting situations, reduces it by 78 percent in low light environments. DSLR-level independent image processor enabling noise reduction when shooting and intelligent detection of a high-contrast lighting environment. •Four professional quality low-light shooting modes giving users access to a virtual photo and video studio to capture artistic inspirations. For example, the Light Painting mode, one of the four professional quality low-light shooting modes, leverages the HUAWEI P8’s manual camera shutter to capture broad swaths of light. Light Painting mode can capture a rolling ferris wheel at night, showing the circular streams of light in an artistic photo. Users can also “light paint” their own freehand pictures using a small torchlight in the dark. Another industry first low light technology is the light check and preview mode. By giving users a preview of what the shot will look like, the device makes it easier to experiment creatively with light sources in the dark. The HUAWEI P8’s Director mode is the industry’s first professional-level video capture function on a smartphone. It allows consumers to direct and control up to three other Android phones when shooting a video scene from four angles simultaneously, while also synchronize video clip editing. The HUAWEI P8 also introduces a powerful new Selfie mode, which allows preset image enhancement settings to capture and customize everyone’s unique beauty, enabling even more people to get in on the fun. During the process of researching and listening to the needs of elite smartphone users, HUAWEI has addressed emerging pain points around dropped calls and signal degradation. Building on HUAWEI’s DNA of world-class communications technology, the HUAWEI P8 has re-defined the industry benchmark for seamless network connectivity.